A small village near Cluny, with a long history and a vibrant present. I first heard of Taizé as a style of meditative singing, as practiced by the monks of this small community in southern Burgundy. The singing style is simple: chant like, repetitive verses, sung softly in a group, without specific direction, as a form of prayer. 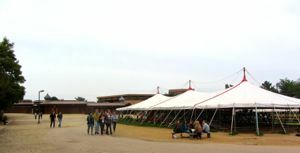 Impressed with the beauty and simplicity of the songs, such as Ubi Caritas, I looked forward to visiting Taizé. The village of Taizé, just 10 kilometers (6 miles) north of Cluny (map), is very old. Its small church dates from the 12th century and is in the Romanesque style. The Taizé monastic community was formed in the 1940s to serve the needs of refugees after World War II. Over the years it has grown to a place of Christian pilgrimage, attracting people from around the world. The community consists of about 100 monks from various religions and various countries, drawn together by the desire to reconcile divided communities. They sponsor young adult meetings that attract thousands of young people (ages 18 to 28) from around the world. Their aims are "to seek communion with God through prayer and to be a leaven of peace and trust in the midst of the human family." Daily programs include three prayer sessions and workshops. Although their emphasis is on young adults, others are welcome. Recordings of Taizé music are available for purchase. 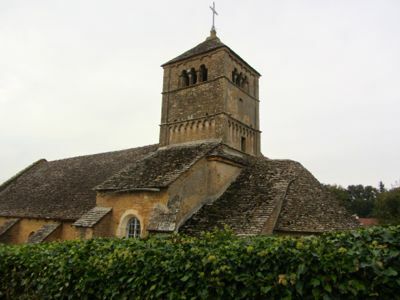 The Taizé community sits above the village of Taizé, and to see the Taizé Romanesque church you will need to go into the village. The closest Romanesque church to the Taizé community may actually be in Ameugny, a lovely small village with beautiful views over the valley. It's just 1.2 kilometers (3/4 of a mile) north of Taizé, an easy walk or drive. Built from local reddish limestone, it is a solid, simple, and beautiful structure. Both churches were affiliated with the Abbey of Cluny, though the Ameugny church proudly proclaims that its building was begun before the Abbey church was started! 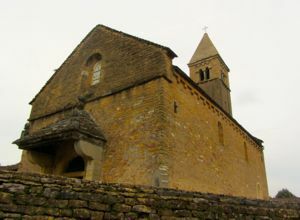 Above, The Romanesque church of Taizé. Below, Life in the Taizé community, France.